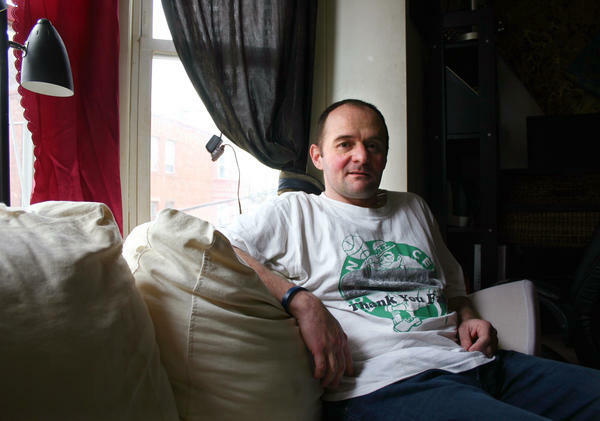 Christopher Milford in his apartment in East Boston, Mass. He quit abusing opioids after getting endocarditis three times. In his late 20s, Christopher Milford of East Boston, Mass., got high on some OxyContin his friend gave him. By the time he was in his early 30s, he was shooting heroin and Suboxone. Milford would reuse the same needle for a week or more. Then, one day, he was so sick he couldn't get out of bed. "It felt like the worst flu I ever got in my life," he says. "It almost felt like a dream. I started doing weird things like putting PlayStation controllers in the sink in the bathroom. It was just weird, off the wall." Milford had endocarditis, which is essentially an abscess on one of his heart valves. He spent seven weeks in the hospital on intravenous antibiotics. Eventually, he went back home. But he kept injecting drugs, and he got endocarditis two more times. After the third time, Milford quit abusing opioids. Six months later, he was smoking a cigarette when he noticed something was wrong with his hand. He kept dropping the cigarette. A few minutes later, he couldn't talk. "I wrote 'stroke' on a piece of paper, handed it to my mother and she called the ambulance," Milford remembers. "I couldn't talk. It was scary. Scariest feeling in the world. And that's why I'm talking like I am." Milford now stammers when he speaks, one result of the stroke he suffered. The damage from the three bouts of endocarditis was even worse. When he was just 35 years old, he had two heart surgeries to implant a pacemaker and replace his infected valve. Milford is part of a group of opioid addicts whom doctors describe as the sickest of the sick: intravenous drug users, mostly people who use heroin, who get endocarditis. Some aspects of their treatment present an ethical dilemma for doctors. Cardiologists, surgeons and infectious disease doctors can fix the infection, but not the underlying problem of addiction. And when patients who are still addicted to opioids leave the hospital, many keep injecting drugs, often causing repeat infections that are more costly and more challenging to cure. "I don't have a decent way of tracking them"
Jonathan Eddinger, a cardiologist at Catholic Medical Center in Manchester, N.H., has made spreadsheets to keep track of patients like Christopher Milford. Eddinger says people abusing intravenous drugs who undergo heart valve replacement surgery have about a 1 percent mortality rate while they are at the hospital. But those patients are likely to keep using drugs when they leave, and Eddinger wonders how long they are surviving outside the hospital. "It's frustrating," Eddinger says. "I don't have a decent way of tracking them and knowing what's happening to them." Eddinger took lists of patients going back five years and started searching for their names online. "What I did is I went and I used the Internet to figure out if they died afterward," he explains. He specifically looked for online obituaries for patients who had been intravenous drug users and had heart valves replaced. In 2011, Catholic Medical Center treated three intravenous drug abusers with endocarditis. Last year, it saw 51, most of whom were in their 20s and 30s, and most of whom were on Medicaid. Hospitals around the country are seeing the same trend, but no one is tracking the total numbers. From his online searches, Eddinger learned 25 percent of his hospital's patients who had been treated for endocarditis and were intravenous drug users had died after leaving the hospital. Looking through his data, he also could see that group had been expensive to treat. For patients who returned to the hospital multiple times, the hospital was charging insurers about half a million dollars. How many times should you replace the same heart valve? Nancy Teixeira, the director of Catholic Medical Center's Cardiovascular Surgical Unit, says the treatment for endocarditis does not always work if the patient is an intravenous drug abuser. "We've had people come in, get their valves done, go back out and use, and they either die or they show up in extremis because they've used again and now they've reinfected their new valve and they're right back at square one," she says. And surgery isn't risk-free. Scar tissue builds up with each valve replacement. Teixeira is left struggling with a thorny question: How many times should you replace the same heart valve? Catholic Medical Center is one of the first hospitals to write ethical guidelines to help clinicians answer that question. The guidelines call for setting patients up with drug treatment, says Dan Daly, a medical ethicist at Saint Anselm College who helped write them. Daly says that the guidelines are not some kind of moral test. Instead, they are meant to help doctors connect patients with a primary care physician or set them up with addiction counseling. "This is not the patient proving to the medical team that they are worthy of a new valve, that they are worthy of the surgery," Daly says. "We wanted to make sure that that could not happen." Jerome Kassirer, a doctor and the former editor of the New England Journal of Medicine, says whatever guidelines Catholic Medical Center comes up with will probably be helpful for doctors and nurses around the country who are dealing with similar issues. "There's always an incentive to do right for every individual patient and as a consequence [doctors] are going to opt for treating the patient as if the patient wasn't addicted," says Kassirer. Chris Milford's addiction is what caused his endocarditis, and his endocarditis is what drove him to quit drugs. Milford is two years sober and still trying to regain his full speaking abilities. "The damage is already done," he says. "But I've been clean ever since and [I have] no desire to start using drugs at all."